This is soooo cute, Kendra! Your ribbon blossom is fab and I love your new blog look! I love your card! Your ribbon blossom turned out great! THis is super cute. I ahve this set and haven't had two seconds to ink it up. I'm hoping today is the lucky day. Awesome job as always my friend! This card is Very very nice Love it ""
Oooo! I absolutely LOVE the ribbon blossom and the dp is fabulous! This card is just too stinkin' cute! Your ribbon blossom turned beautiful, mine on the other hand looked so horrible I took it apart! Love these colors! And the sparkle is so fun! Very cute! Love the colour combo. 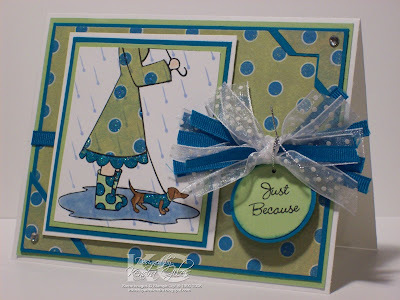 Love the color combination on this one and how you carried the polka dots through the card. I definitely think that I need to stop hoarding my ribbon and add them to my cards!